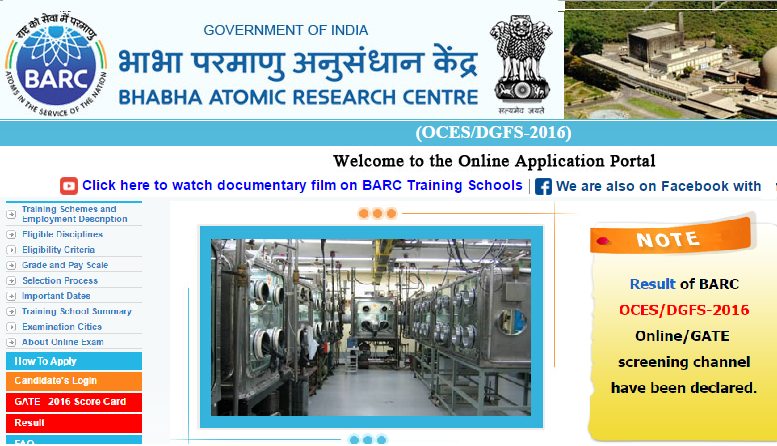 New Delhi: The Bhabha Atomic Research Centre (BARC) has released the result of BARC OCES/DGFS, 2016 examination on its official website. Candidates trying to get BARC OCES/DGFS 2016 results should visit the official website and follow instructions. The shortlisted candidates can enroll themselves for the one-year orientation course which is available for engineering graduates and science postgraduates for 2016-2017 (OCES-2016) at the five BARC training schools situated at Mumbai, Kalpakkam, Indore and Hyderabad. This year, the BARC OCES/DGFS-2016 examination was conducted from March 12, 2016–March 20, 2016 across the country. 4. check according to your need. 5. you can seca or take a printout for further reference.